* Graduate School -> Official Website . * Graduate School of International and Area Studies-> Official Website . o Available course : Masterâ€™s Program, Doctoral Program. HUFS provides additional scholarship to KGSP students who obtain high grades in their degree program. by one of the following organizations: an embassy, an adoption association, or a university. Secondly, applicants who passed the first step must be selected by the NIIED Selection Committee. Finally, applicants who passed the second step must gain admission from a university. applications to more than one organization will be disqualified immediately. – 1st Selection: Each 1st selection organization will draft a selections standard based on the criteria supplied by NIIED, and recommend the best applicants according to its respective standards. – 2nd Selection: The NIIED Selection Committee will select the most successful candidates from the pool of applicants recommended by the 1st selection organizations. – 3rd Selection: All candidates who passed the 2nd selection successfully will be evaluated for admission by the universities which they applied; each candidate will gain admission from at least from one university. * Applicants who were recommended by an entrusted university will automatically be granted admission to the universities which recommended them, upon the condition they are selected as a successful candidate in the 2nd Selection. apply for admission to the university designated by the respective recommending departments. are permitted to start their masterâ€™s or doctoral program. complete an additional six-month coursework in the Korean language. term beyond the designated duration of their scholarship. * Scholars who are exempted from taking the Korean language course may take their degree course starting from September 1st, 2011 or March 1st, 2012. * Scholars who pass at least TOPIK Level 5 during the language course and want to start their degree course on March 1st, 2012 should obtain permission from NIIED in advance. * Applicants who hold Korean citizenship are not qualified for this program. * Applicants have to submit the Personal Medical Assessment (included in the application form) when he/she apply for this program, and then submit an Official Medical Examination Report issued in a hospital to NIIED after passing the NIIED Selection Committee (the 2nd Selection). A serious illness reflected in the examination results will be the main cause of disqualification from the scholarship. o Applicants must be under 40 years of age as of Sep. 1st, 2011 (born after Sep. 1st, 1971). o Applicants must hold a Bachelorâ€™s or Masterâ€™s degree as of September 1, 2011. * Applicants who have ever enrolled in the same program in Korea as the one they are applying for will be disqualified from the program. For example, an applicant who has previously enrolled in a master`s program in Korea cannot apply for the KGSP Master`s Program. * Applicants who apply for the Master`s program must hold a Bachelor`s degree or a diploma that is equivalent to or higher than a Bachelor`s degree. * Applicants who apply for the Doctoral program must hold a Master`s degree or a diploma that is equivalent to or higher than a Master`s degree. * Applicants who are expecting to obtain the relevant required degree or diploma by August 31st, 2011 must submit a certificate of degree or diploma expectation, and submit the official certificate of degree or diploma by September 1st, 2011.
o Applicants must maintain a grade point average (G.P.A.) of at least 2.64 on a 4.0 scale, 2.80 on a 4. 3 scale, 2.91 on a 4.5 scale or grades/marks/score of 80% or higher from the previously attended institution. -Airfare : Round-trip economy class ticket. * Airfare for entry will not be provided to scholars who already presently live in Korea for academic study or employment. * The fees for domestic travel within a scholar`s home country and for travel insurance to and from Korea will not be provided. -Tuitions : All admission fees are waived by the host institution. The tuition is paid by NIIED. -Medical Insurance : 15,000 won per month will be provided (limited coverage). o The guideline, application form, and university information will be available at the websites of NIIED (www.niied.go.kr), GKS (www.gks.go.kr), Korean Embassies, and entrusted domestic universities. recommend more than 2 candidates from a single country. Countryâ€™s quota from all the candidates recommended by the universities. to the university which recommended them, and also be accepted as official KGSP scholars. KCUE (Korean Council for University Education) Official Website . Learning Korean Official Website . 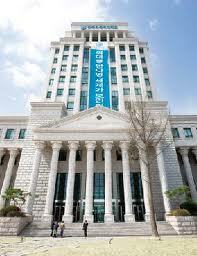 Universities and Graduate schools in Korea Official Website . Understanding of Korean culture Official Website . Overseas Korean embassies Official Website. Visa and Registration Official Website. Demikianlah artikel mengenai Korean Government Scholarship Program for Graduate at Hankuk University Students Semoga Bermanfaat Bagi Anda.